This episode, Refusing Your Fears, follows the final day of the YouVersion Reading Plan, Resting Well. You can find this four day Reading Plan on the YouVersion App (Bible.com) or read it here on the SheYearns website. You can now check out Refuse Your Fears from iTunes, GooglePlay, Stitcher, or SoundCloud. Just click on the links below! As always, you can scroll down and listen right here! Five of my children are taking the public school mandated assessments. Failing the test would mean not promoting to the next grade. My kids feel the weight of the responsibility today, but they have not always. One squirrely rascal refused to listen to teachers or their PHD Reading Specialist mom! This child possesses the fortitude of a CEO bottled up in the body of a tadpole. They can exhibit a wiseacre attitude. You cannot teach a person who thinks they already know what they don’t know. Needless to say, the child didn’t do well. It’s the best thing that ever happened to them! I sat with my future CEO, knee to knee, offering reasons we believed they failed to succeed. First we cried and embraced the tragedy of the situation. Then I cautioned them about remaining on this path, and we proposed a new plan. Becoming teachable and open to receive what the authority in their life offered would be essential. We find ourselves in a similar tender, but firm encounter with the writer of Hebrews. Picture yourself sitting knee to knee. Just after the warnings and the challenge to strive toward entering His rest is given, a plan for how to be successful is made plain. You and I can be just like my squirrely kid. We sometimes think we already know what we don’t know. The writer steers us on a course for success. This Gospel–this Word, is different! We are encouraged to embrace this Gospel because it is changeless yet able to meet us where we are. It lives. We have no other resource to which it can compare. For true rest, we must read this Word and receive this Word. Podcasts won’t be enough. Reading plans will not do it. Attending a great God-honoring church is wise and prudent, but will not satisfy the need. You and I must commit to hear it. See it. Memorize it. Get the Word in us any and every way possible-– but let it be the actual Gospel, not something about the Bible. Do you want out of those desert places of wandering? Are you teachable? Can you receive what the Lord is ready to give? The key to believing God and leaving those desert wanderings behind is through the living Word of God. And you will be on your way to Resting Well. You can find today’s podcast by clicking HERE. The invitation offered in Matthew 11:28 is generously inclusive. Most of us could admit to laboring at some point. We are invited to bring even our most grievous trouble– the ulcer-causing kind. Those of us who are overwhelmed with responsibility, as well as exhausted are welcome, too. Who isn’t glad Jesus calls us to Himself? But if you and I were honest, do we really have any practical idea WHAT WE ARE SUPPOSED TO DO with the invitation? Am I supposed to stop doing everything? Do I zone out of my burdened life and just quote scripture? Does it simply mean to stop worrying? What is Jesus calling us into out of our exhausted states–our situations and worries that are spilling into our functionality? We need to know because these are the places we live! Some are working ourselves dizzy. Some of us truly are taxed emotionally. The loss has been too great this year. The financial issues are too complicated. The relationship drama is ever-present and oppressive. The emotional strains are taking a physical toll. Or maybe what others genuinely need from you has over-extended you until you have become ill. My dear friend cared for her mother in her final months. The day after she passed away into Glory my friend suffered an illness that land her in the ICU! She had given everything she had until the very end. Isn’t that like us? You and I have no sense! We often give beyond what is good for us, personally. Therefore, most of us are bone-weary desperate to experience the kind of rest Jesus beckons us into. This particular rest is a temporary respite from activity, or from service or work. He knows there will be times when we give everything we’ve got to the end. And there is nothing left. There are no substitutions. Jesus is the only One who can give us what we need to get back in there. Nothing else will do. I don’t know what you need. But He does. You don’t know what I need. But He does. God knows we need Him to cause us to rest. For there is work to be done. And we want to be fit to do it. I hope you will take five minutes for today’s podcast, “The Path to Soul Rest.” Just click on the link. Among other issues, fatigue is known to cause thousands of traffic accidents per year. It slows our cognitive processing, and is related to serious health problems such as heart failure, diabetes, and strokes. But the reality that it impairs our judgment about our need for rest, I found must fascinating! Somehow we think we are above slowing down. No. Those other poor souls can’t hack it. Just give us a power nap or hand us an espresso and we will keep going. But the truth is, we deceive ourselves. Even the Son of Man got tired. At one time, Jesus and the disciples boarded a boat, and a great storm swells. But Jesus is unmoved by the hurricane-force wind and the ferocious waves because he is sound asleep below. This is not a cruise ship nor is it a few clouds. These were fishermen who believed they were about to die. The God-man was exhausted. Another time He and disciples are traveling by foot when they arrive at Sychar in Samaria (John 4:6). Jesus is physically tired from the journey and needed to stop and rest, just like you and me. You see, God created humanity to require rest. “Six days you shall labor,” (Exodus 23:12), “but on the seventh, you shall rest.” Contrary to my backward and twisted thinking, resting is not a sign of personal weakness. It’s not punishment for not being able to do it all myself. It is simply God’s good intent toward us. God knows our tendency toward exhaustion: physically, emotionally and often spiritually. But do not think for a minute resting well is not a call to lazy couch potato living. On the contrary. There are six days of work set aside for work which means the expectation is that we be productive most of the time. But there is also a high price to pay for NOT resting. You and I need to find the Biblical balance. 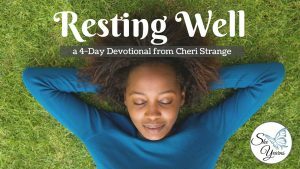 Over the next several days, we will discover what the Bible says about rest, what is the cost of not resting, and strategies you and I can implement into our daily routines for resting well in Christ. Don’t forget to listen to the Podcast, Does God Care if I’m Tired? Just click on the title!